“Bait” is an essential element when we talk about raising carps in Sakai Fish Farm. Sakai Fish Farm has been developing its unique method of producing original bait for growing carps more beautifully and much bigger. It was not an easy way, but we never gave up. 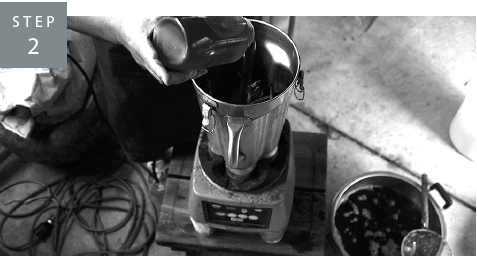 We continued improving the bait year after year, and created Sakai’s original “Reviver Weight-Gain Mash” and “Germ Weight-Gain Mash”. These 2 kinds of mash are developed by focusing on taste, nutrition balance, and feed efficiency. They have been improved time and time again, and are now one of the most important materials for Sakai’s bait. 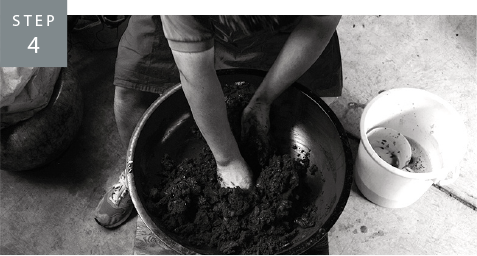 Moreover, skilled staff adds a variety of ingredients, then after various processes, our “dough bait” will complete. Although producing our “dough bait” is quite complex and time-consuming、we spare no effort and time to feed our carps sufficiently. Carp’s health is very delicate. 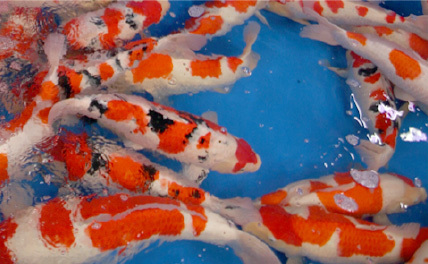 Our carps a「e carefully managed and monitored, resulting in the vivid color and beautiful gloss. 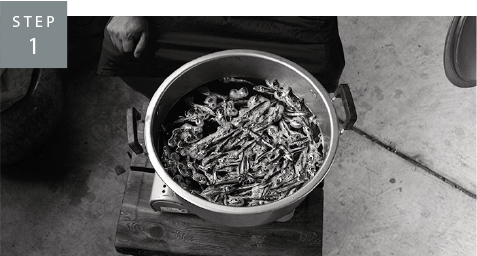 Today, we would like to introduce the “dough bait” production process which Sakai is proud of. Boil water in a large pot.Add a chunk of round herrings in the boiling water.Carps have sharper sense of taste and smell than humans.So、round herrings will enhance the flavor of the bait, resulting in stimulating carps’appetite. It is essential to feed them sufficiently in order to grow carps more beautiful and bigger.Mixed round herrings will strike carps dramatically.Aroma of round herring soup is all around.It is very enticing aroma. Take out the herrings from the pot and put them in the blender.Add honey, tofu, herring soup and quickly process them.Carps have more sensitive taste than humans、and they tend to like sweetness.So in order to entice carps、we flavor our bait with unique ingredients.Use a lot of honey, which is high in nutrition and has strong sweetness for carp’s preference.Also add tofu for its vegetable protein.Then quickly blend these ingredients in our unique formula for the best balance of flavor, taste, and nutrition. 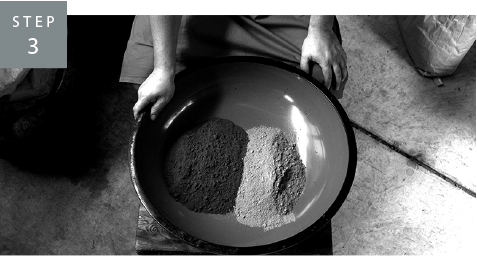 Add Sakai’s original Reviver Weight-Gain Mash and Germ Weight-Gain Mash in a bowl.This powder is the key to grow Sakai’s healthy and beautiful carps.These 2 kinds of weight-gain mash are the original mash that Sakai Fish Farm has developed over countless improvements. They are effective For growing carps bigger and healthy, livening up carp’s color, helping bait digestion, and polishing body.Both mash are essential materials For raising big and beautiful carps. 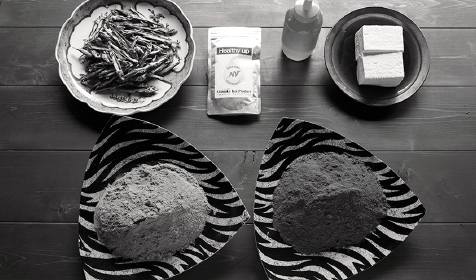 In this step, mix all the ingredients, and knead the dough bait.Nutrition is perfect with the supplements for carps which is rich in the vitamins to strengthen immunity system and nourish internal organs.Continue to knead the dough so all the ingredients are completely combined.Kneading will not end until the texture of the dough is all smooth. After ingredients are well mixed, the final step is remaining. “Water” and “firmness” are the key factors here.If the the level of water contained in the dough is a little too much or less than the appropriate level, bait will dissolve in pond water too fast. So it is necessary to keep the right amount of water to make baits moist.The experience and sense of staff are the only clue to blend the right amount of water and exquisite firmness which are necessa「y for this bait. After kneading and checking the texture with skilled hands, Sakai’s bait will complete.